Join us at our community Inspiration for the 3rd Annual REALTOR® Oktoberfest! We are thrilled to bring this event back for its third year, and we are doing it in a big way! We’ve got your chance to win tons of fabulous prizes, and be sure to RSVP in advance of the event to be automatically entered to win our RSVP prize: Dinner for Two at the Bavarian Grill in Plano! We have fantastic entertainment lined up from the Alpine Village Band. You might have seen them frequenting events all over DFW such as the Ft. Worth and Addison Oktoberfests! We can’t wait for you to hear them in Inspiration! Of course, it’s not Inspiration Oktoberfest without plenty of German festival food favorites and plenty of beer and wine for everyone! With a forthcoming $9M amenity center slated for completion in early 2019, jump on our bus tour and get a first-hand look at the progress on Club Inspiration! You’ll also have the opportunity to mingle with our lineup of award-winning builders and get to know what makes Inspiration so unique. 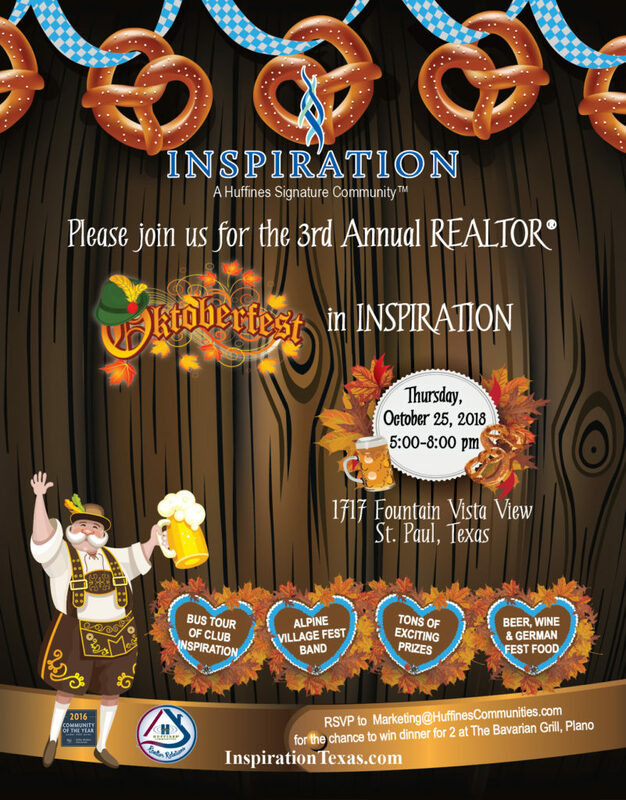 Inspiration’s Annual REALTOR® Oktoberfest is an event we always look forward to, and we can’t wait to see you there! See photos from last year’s Oktoberfest here!